For many families, ham is part of a holiday tradition. The nation’s largest producer – Smithfield – is based in Virginia, and this state is home to more than a quarter of a million pigs. This story is the first in a five-part series looking at the impact of a growing industry on the environment, on the animals and on public health. Listen to Sandy Hausman's report here. For example, he and Kat gave their hogs names. “We call her Limpy, because she’s got a bum leg. This is Goldie, Big Mama and this is Big Mama’s daughter,” says Milne. "We're not raising them as pets, even though we treat them as pets." In the end, all of the piglets in that litter died, and after Milne nursed the sow back to health, she too passed away after being bitten by a poisonous snake. One day later the boar died from an infection. That’s when Milne decided to get out of the pig business and invest in mushrooms. For bigger players in the pork game, it’s not so easy. These days an average pig farm in this region will have more than 8,000 animals, and to assure they make it to market the industry says it must control their environment. The industry claims it’s changing, and WVTF and RadioIQ hoped to find out where things stand in 2016, but our efforts to actually visit a large pork production facility were frustrated by farmers who claimed letting a journalist into a pig barn could endanger the animals’ health. Humans and pigs are subject to some of the same viruses, such as swine flu, which was actually spread from people to pigs. Mark Estienne is a professor of animal science at Virginia Tech. 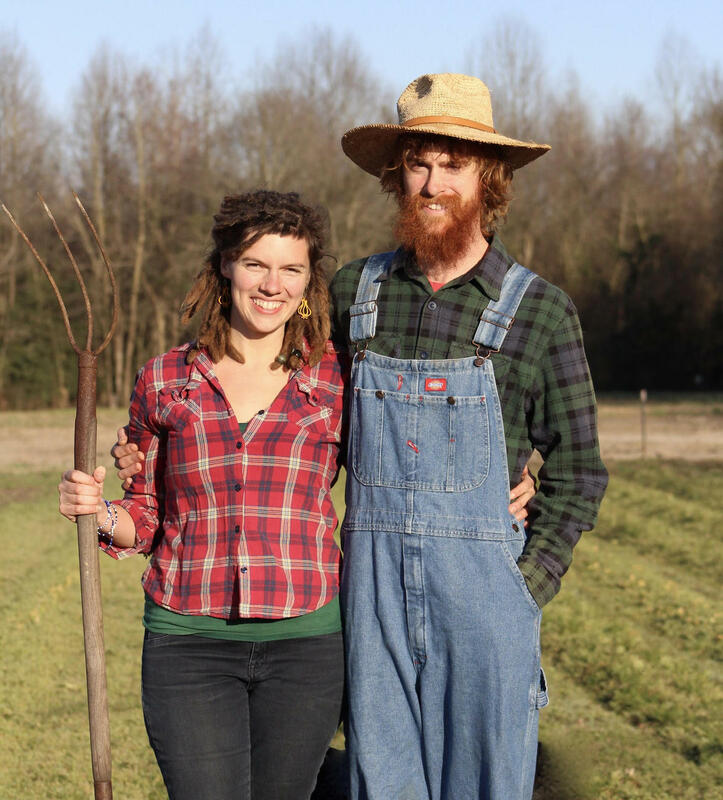 I spoke with him in a barn at the Tidewater Agricultural Research Center. Some producers might also worry that images of pigs in close quarters could upset consumers, prompting a number of so-called Ag Gag laws that make it illegal for journalists to visit farms and report on conditions without permission. Here, again, is the Humane Society’s Paul Shapiro. Smithfield is the world’s largest producer of pork in the world – a Virginia-based company with farms and packing plants in the U.S., Poland, Romania along with joint ventures in Mexico. Each year the firm raises 16 million animals, and it buys another 14 million from independent farmers to supply the world with bacon, ham and other products made from pigs. In part two of our series, Sandy Hausman visits company headquarters in Smithfield, Virginia. In part two of our series, Sandy Hausman visits company headquarters in Smithfield, Virginia to talk about the environmental impact of the enterprise. Reporter's note: While a source refers to Smithfield's parent as a Chinese Company, the firm is actually based in Hong Kong. Pigs are big – about 250 pound on average, and they’re productive. Bob Musel is executive director of the Rachel Carson Council, an environmental group that recently produced a report called Pork and Pollution. That waste is stored in massive lagoons – some the size of several football fields. They dot the landscape of southeastern Virginia and North Carolina, Musel says, sometimes polluting water and air. At Smithfield Foods, the world’s largest producer of pork, Stewart Leeth admits some lagoons emit methane, but at others the company is beginning to capture it. And as Smithfield’s Chief Sustainability Officer, he feels good about the waste treatment procedures in place. And he argues the situation is better than it would be if large companies like Smithfield didn’t dominate the market. "There's so much animal waste that the crops just can't take up that much." 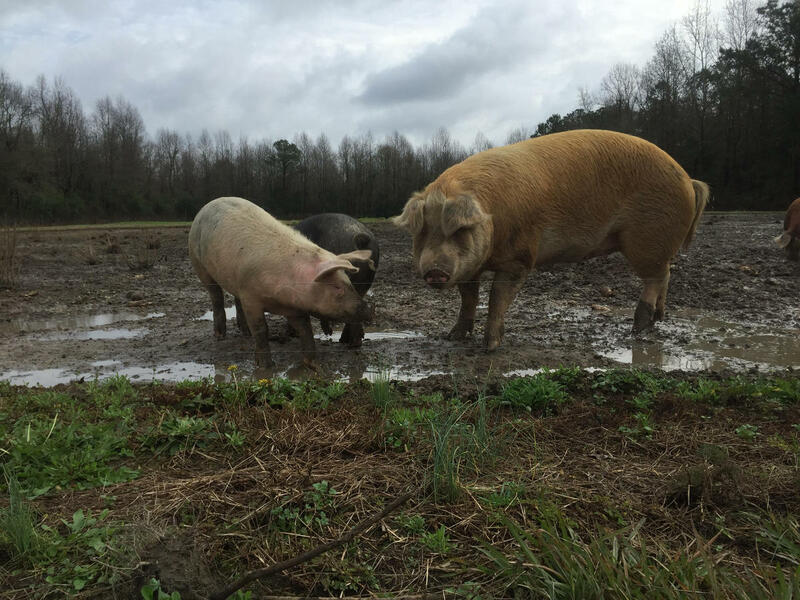 But at the Southern Environmental Law Center, attorney Geoff Gissler says the permitting process isn’t keeping pig waste out of North Carolina’s water. That’s Travis Graves, the Lower Neuse Riverkeeper. It’s common knowledge, he says, that lagoons leak. In the past, lagoons have also spilled into rivers and wetlands, killing fish, causing algae blooms and dead zones. When Hurricane Floyd hit in 1999, at least five lagoons burst and 47 were flooded. Graves thinks pig farms should have on-site wastewater treatment plants like what cities use to take care of human waste, and he dismisses industry claims that those systems – which cost $250,000 up – are just too expensive. He doubts that an industry which spends millions on political campaigns and lobbying will be required to treat its waste, but several environmental groups have filed lawsuits against Smithfield and other pork producers. Concerns about the industry also come from animal rights advocates. This part of the nation has long been a hub for pork. The world’s largest producer, Smithfield, is based in the Commonwealth, and there are as many pigs as people in North Carolina. In fact, you can trace the history of ham and bacon back to the 1600’s, when settlers arrived from England, but raising pigs in the 21st century is a whole new game. When Americans think about pig farming, they might think fondly of the children’s classic Charlotte’s web - a tale told on film by the beloved animator Hannah Barbera. "When the pork industry locks pigs inside of these crates, the animals go insane. They stand or lay in the same position 24 hours a day on hard concrete. Many of them bite the bars of their cages in front of them maniacally until finally they just give up." But today’s pig is even more miserable than Wilbur according to animal rights activists like Paul Shapiro at the Humane Society of the United States. He points to stalls or crates about 14 square feet where pregnant pigs are kept. You can hear baby pigs nibbling the metal at Virginia Tech’s Animal Science Research Center in Suffolk, but Professor Mark Estienne doubts they’re going crazy. He’s studied this behavior and says it’s just something swine do. “The amount of bar biting in our study was similar between the pigs in the pen versus those in the crates," he says. We asked if free range pigs would also bite on things. Estienne replied that they would. He says keeping pigs in close quarters prevents them from hurting each other. Mother pigs, for example, are known to roll onto their newborns - crushing the babies. Keeping them in a separate crate protects the piglets, and having their own space ensures sows get equal amounts of food. Estienne says some hogs go hungry when kept in one large pen. “There’s going to be at least one or two what we call 'boss sows' that are going to monopolize the feed resources," he explains. Still public pressure has prompted the world’s largest pork producer -- Smithfield Foods -- to move away from crates. Eighty-two percent of animals on company-owned farms live in pens, and Smithfield’s contract producers are supposed to make the switch by 2022. Critics of the industry also point to the treatment of baby pigs. Their tails are usually snipped off soon after birth to prevent infections that can occur when other pigs bite them, and mega farms routinely remove the testicles of males -- both procedures done without anesthesia. Again, the Humane Society’s Paul Shapiro. At Smithfield. Chief Sustainability Officer Stewart Leeth claims cutting off pig tails and testicles doesn’t really hurt the animals, and their squealing is actually a response to being picked up. Professor Estienne thinks the animals do feel pain, but as he gently cradles a piglet, it seems Leeth might have a point. These creatures really hate to be held. Today’s breeding sows spend most of their lives -- usually two to four years -- pregnant or nursing. Other pigs are slaughtered after about six months, and regardless of gender, the animals spend no time outside. Their close quarters put pigs at increased risk for epidemics, prompting farmers to feed them antibiotics to prevent illness. A World Health Organization report recently warned that eating meat puts people at a greater risk for cancer, but that hasn’t hurt the market for bacon, ham, pork chops and roasts. Nor are consumers deterred by other deadly health hazards linked to the industry. The world’s largest pork producer – Smithfield Foods -- slaughters 30 million pigs a year. Jennifer England is director of the Isle of Wight County Museum in southeastern Virginia. The centerpiece of its collection is the world’s oldest ham – a petrified piece of pork that dates back to 1902. She says pigs have been central to this area since Jamestown. “The first settlers came over with pigs. Hogs are very easy to grow. They’re not single serving like a chicken, but they’re a lot easier to manage than say a cow,” says England. And living in such close quarters, the animals are at risk for epidemics. 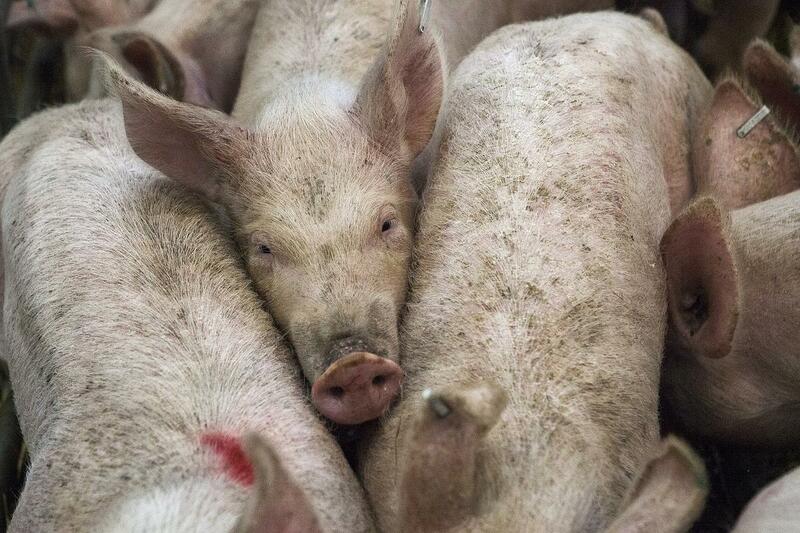 In 2012, a new virus swept through America’s pig farms, killing 12 million hogs. Bacterial infections are also a threat, so farmers routinely feed antibiotics to prevent sickness and promote growth. At the Humane Society of the United States, Paul Shapiro worries about the evolution of antibiotic resistant bacteria that have emerged on livestock farms. The federal government recently restricted farmers’ access to antibiotics used by humans, but deadly outbreaks of salmonella, e-coli and other resistant strains continue in human populations where meat is consumed. There are also reports of health problems in communities near large hog farms and among employees. Gray Jernigan is an attorney with Waterkeepers Alliance. He says asthma and other breathing problems can be linked to waste storage lagoons and the use of that material to fertilize farm fields. “We see air pollution from open waste pits such as ammonia, greenhouse hydrogen sulfide.We also see the spread of anti-biotic resistant bacteria such as MRSA from the low level antibiotics used to keep these pigs alive,” says Jernigan. While lawmakers and government regulators have failed to prevent these problems, thousands of people have sued large pig farmers, claiming they’ve ruined the quality of rural life, and in our next report, we’ll tell you how consumers are promoting changes in the way pigs are raised in this country. Virginia is home to the world’s largest pork producer – a Chinese owned company called Smithfield, and this region produces nearly nine million hogs a year. It’s also a hotbed of opposition to the factory farms where most of those animals live. In the last of our reports on the Perils of American Pork, Sandy Hausman looks at what critics are doing to promote change. Margaret Riley is a professor of law at the University of Virginia and the head of its Animal Law Program. She admits to a fondness for pigs. So you might expect her to advocate stronger laws for the protection of hogs on American farms. In fact, she doesn’t think that’s the best way to go. Case in point, people who felt it was wrong to keep hogs in small crates or stalls shared their views with Smithfield, the world’s largest pork producer, and Chief Sustainability Officer Stewart Leeth says the company listened. "They are such smart, social animals that it is really crucial to treat them well." And contractors who raise pigs for Smithfield will also switch to open pens by 2022. In addition, some states are taking action. 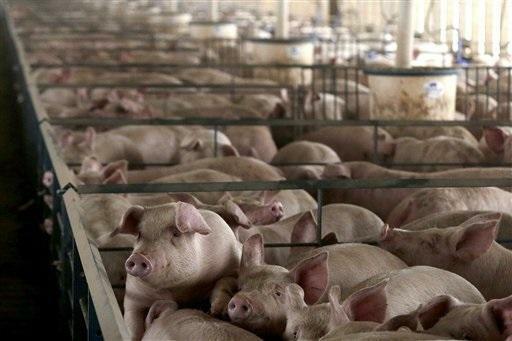 This fall, Massachusetts will vote on whether to require pork producers selling there to provide their pigs with enough room to move around, and at the Humane Society of the United States, Paul Shapiro says pressure is coming from big corporate customers like McDonald’s. Consumers might also switch to free range pork from pigs raised on small, organic farms, but Professor Riley says they must be prepared to pay more. Scientists are also pushing the industry in new directions. At Virginia Tech, animal science Professor Mark Estienne is experimenting with feeding pigs probiotics rather than anti-biotics – good bacteria that could help prevent illness by boosting the animals own immune systems. And, he says, a new study shows sows are more productive if they grow up in less crowded conditions. Then there are those who simply refuse to eat meat. Nadia Taha is with People for the Ethical Treatment of Animals. Vegetarianism is increasingly popular – especially among young people in the U.S., Canada, Europe and Australia, but UVA law professor Margaret Riley says demand for meat is growing in countries like China and India. Which could explain why a Chinese company recently bought Virginia-based Smithfield. Ultimately, Riley hopes environmental, medical and ethical concerns will be addressed by laboratories in Silicon Valley or the Netherlands, where scientists are searching for ways to use vegetable proteins or cultivated animal cells to craft something that looks, feels, cooks and tastes like meat.